The Audi S3 takes Audi’s sporting focus and crams it into a sedan-only sports package. The 2.0TFSI motor with 292 hp and 280 lb-ft drives all four wheels via Audi’s quattro and a 6-speed dual-clutch automatic – 0-60 mph acceleration takes just 4.7 seconds. Prestige trim is a must-have for the virtual cockpit and B&O sound system, whilst the S Sport seat package adds quilted leather sports seats. 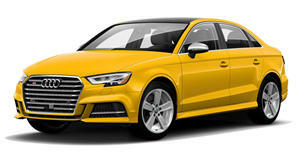 The S3 boasts a 5-star NHTSA safety rating, thanks to AWD, lane keep assist, cross traffic alert, stability control, adaptive cruise control, and forward collision warning.